Preheat oven to 350. Line or grease and flour 12 wells in a cupcake pan. In a large bowl, cream the butter and sugar. Add the egg, mix thoroughly. Add flour, baking powder, chipotle powder, and salt to the butter mixture. Add the milk and mango nectar to the rest of the batter and beat until well combined. Fold in mango. Fill each well 2/3 of the way full. Bake about 15 minutes or until a toothpick inserted the center of a cupcake (try to avoid spearing a mango cube!) comes out mostly clean. Cool briefly in the pan, then remove cupcakes to wire racks to cool completely before icing with key lime cream cheese frosting. Ice. *Available at most well-stocked grocery stores, mango nectar is made from mango pulp. I've found it in the "international foods" isle more often than the beverage isle, so look there first. The combination of mango and chile might sound odd at first but it is actually quite good. This recipe was inspired by the mango vendors I've seen in NYC that take a mango, peel it, stick a skewer in it and sprinkle it with chile powder and salt for an addictive spicy-sweet snack. Today's our third anniversary and I wanted to make something fun. Matt loves anything spicy and we both love mangos so it was an obvious choice. 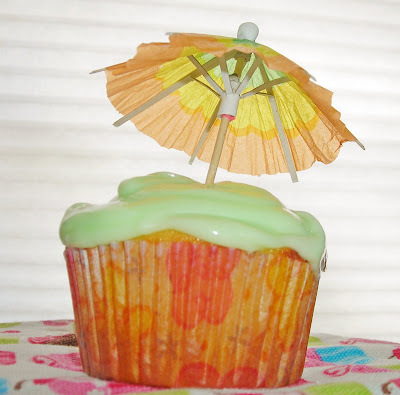 I paired it with key lime frosting to keep the tropical feeling present (plus the mangos-on-a-stick are often doused in lime juice) but I think it would be great with a mango icing or even just plain buttercream.